Saying thank you and showing your gratitude is something that I feel is very important to do. Even though I’m a blogger and very tech-savvy, I’m all about saying thank you the “old-fashioned” way. This week, I’m all about saying thank you and showing some gratitude in some pretty cool, creative and trendy ways. I’m a stickler when it comes to sending thank you notes and showing some modern day-gratitude. As much as I love the tech savvy world (and I consider myself a tech savvy-girl), there’s just something very genuine and warm about opening your mailbox to a surprise from someone. You know what I mean, right? You’re actually holding something tangible in your hands and it’s sending a happiness reaction through you. I love that. With so much happening recently in my personal life with my husband, I’ve been sending out quite a few thank you notes throughout the last four weeks. I’m not kidding when I say that I’ve been on a mission to find the best and most creative cards and ways to say thank you. It’s become fun for me, finding those true gems out there that express how I feel in the perfect way! Thank you photo cards are very cool to receive. Everyone loves receiving a card with a photo. We were at a wedding this past summer, and the bride and groom sent us a thank you card with the two of them on the cover from their wedding, holding a sign that read, “Thank You.” It left an impression. I thought it was genius. And I thought to myself… this is perfect for any event, occasion or special something. It shows true gratitude and you can make it as creative as you want! Brown Paper Gifts on Etsy has the most delightful Thank You Card set. What drew me to this set was the fact that the card defines and outlines truly what it means to be thankful. Definitions featured on the card are: acknowledgment, appreciate, consideration, grateful, recognition and thanks. This set captures the perfect amount of thanks. 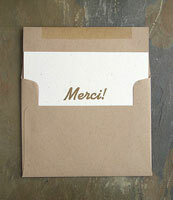 Seaborn Press offers multilingual thank you cards that are just fabulous! Thank you doesn’t always need to be said in just one way, and I think it’s so creative and clever to send a card out with a different form of “thank you!” Merci! Inspired By It cards. I’ll divulge that this is my sister-in-law’s card line, but it’s exquisite and very chic! This is a card line that captures the beauty and importance of a simple thank you by sending a meaningful and inspirational message. Believe me, your receiver will be inspired by it (pun intended). A personal thank you from you. I’ve been sending out a bunch of these lately. Simply buy card stock paper and write on the front of the card all the things you’re thankful for about the person you’re sending it to. This is the most personal and creative way to say thank you and show your gratitude.